Preheat oven to 180C/160C fan-forced. Grease a 20cm x 30cm lamington pan. Line base and sides with baking paper, extending paper 5cm above all edges of pan. Place butter and dark chocolate in a medium saucepan over low heat. Cook, stirring, for 5 minutes or until melted. Remove from heat. Stir in caster sugar. Cool for 10 minutes. Add egg to chocolate mixture. Stir to combine. Sift over flour. Stir until combined. Spread mixture into prepared pan. Bake for 20 minutes. Cool. Meanwhile, make Caramel filling: Place condensed milk, golden syrup, brown sugar and butter in a saucepan over medium heat. Cook, stirring constantly, for 10 to 12 minutes or until light golden (see note). 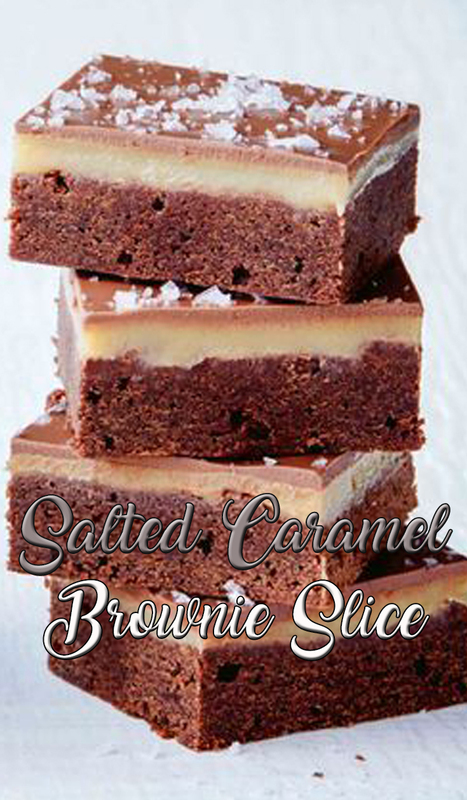 Pour caramel over brownie base. Bake for 10 minutes. Cool completely. Refrigerate for 3 hours or until set. Make Topping: Place chocolate and oil in a heatproof bowl set over a saucepan of simmering water, ensuring base of bowl does not touch the water. Stir until melted. Spread over caramel. Sprinkle with salt. Refrigerate for 1 hour or until set. Cut into squares. Serve.